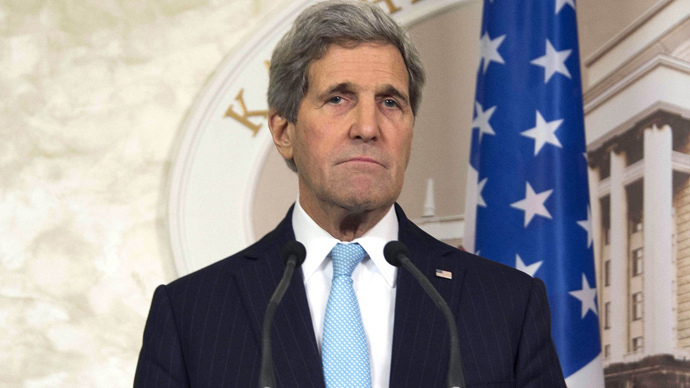 The US could lift Russia sanctions if the Minsk agreements are fully implemented, US Secretary of State John Kerry said in a statement. The White House praised the Minsk deal on Thursday, saying that it was a "potentially significant step." READ MORE: Restrained optimism follows Minsk summit, new Russia sanctions off table? “As we have long said, the United States is prepared to consider rolling back sanctions on Russia when the Minsk agreements of September 2014, and now this agreement, are fully implemented,” said Kerry in a statement Thursday following marathon 16-hour talks between the 'Normandy 4' leaders in Minsk. “That includes a full ceasefire, the withdrawal of all foreign troops and equipment from Ukraine, the full restoration of Ukrainian control of the international border, and the release of all hostages,” Kerry said. He added that the US “welcomes” the agreement struck by Germany Chancellor Angela Merkel, French President Francois Hollande, Ukrainian President Petro Poroshenko and Russian President Vladimir Putin. The White House also praised the Minsk agreement on Thursday, calling it a "potentially significant step" in the resolution of the Ukrainian conflict. Despite the historic deal brokered in Minsk, State Department spokeswoman Jen Psaki told reporters Thursday that US was continuing consultations on possible new sanctions against Russia. "We have not taken ... options off the table. Those discussions are ongoing," she said, answering a question on the issue. "Certainly our preference would be to see this agreement and components, including a ceasefire, including the pullback of heavy weapons and a complete withdrawal of foreign fighters, implemented." Psaki said that if the Minsk deal is not implemented, Kiev would not be blamed for not fulfilling its commitments under the document, RIA Novosti quoted her as saying. She also said that Washington has not dropped its consultations on supplying weapons to Ukraine. EU leaders have voiced their positive impressions after the Minsk deal was reached, expressing hope that peace and stability would soon reign in Ukraine. “Therein lies hope," tweeted German Chancellor Angela Merkel's spokesman, Steffen Seibert, as the deal was struck. French President Francois Hollande called the deal a "comprehensive political solution" which would engender "serious hope, even if everything is not done." "The agreement in Minsk is a welcome step towards what I hope will be a durable, and peaceful solution to the conflict in Ukraine and toward restoration of Ukraine's sovereignty and territorial integrity," NATO quoted its Secretary General Jens Stoltenberg as telling Norwegian news agency NTB. Vice-President of the EU Commission Federica Mogherini said new sanctions against Russia were unlikely to be discussed at the EU summit in Brussels on Thursday. The EU officials who gathered in Belgium would focus on how “all possible EU means” can be activated to help sustain the ceasefire deal once it goes into effect, she added. The deal came after President Hollande and Chancellor Merkel visited Kiev and Moscow last week for separate meetings with the leaders of Ukraine and Russia behind closed doors. The secretive meetings were held on the initiative of the two EU leaders, who reportedly flew to Russia without consulting Washington. “Together with Angela Merkel, we have decided to take a new initiative,” Hollande told a news conference last Thursday. As Hollande and Merkel were set to discuss a peaceful resolution to the conflict, Kerry was visiting Ukraine to answer Kiev’s plea for weapons. Washington is mulling whether to provide Kiev’s forces with what it claims are “defensive” weapons, backing the Kiev government up in its aspirations with rhetoric about alleged Russian military’s presence in Ukraine. The unsubstantiated claims have been rebuffed by Moscow on numerous occasions. On Thursday, Ukrainian experts also stated that they have not observed any military activity on the part of Russian troops in the course of an inspection that was held in Russia's southern Rostov region, bordering Ukraine, from February 9-12.